This is a most popular tourist place in Hong Kong. 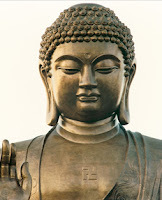 It is a outstanding piece in Buddhist sculpture art and is a valuable heritage of Mankind. After reaching to Hong Kong, the Visitors/Tourists can reach the place by Bus/Taxi/Ferry by choosing any one of the following routes. Route1: First reach MTR Tung Chung Railway Station, then take Ngong Ping Cable car which takes 25minutes journey to reach Ngong Ping. Route2: First reach MTR Tung Chung Railway Station, then take New Lantao Bus No.23 to reach Ngong Ping. Route3: First reach Mui Wo(also known as Silvermine Bay), then take New Lantao Bus No.2 to reach Ngong Ping.